So-called American Roots Music is a getting a fair amount of attention these days. Inspired by the revival of interest in folk, blues and early rock & roll, the style concentrates on guitars, shuns synthesizers, and often includes instrumentation such as accordion. While it has a lot of time-tested elements, this sound in its current form is a relatively new one, and arose partly as a reaction to the processed and sometimes pretentious sound of commercial pop in the 1990s. 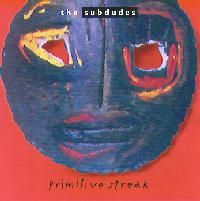 One group that personifies this sound is the Subdudes, whose new, fourth album is entitled Primitive Streak. The Subdudes got their start in 1987 after three of the band's members relocated from Edgard, Lousiana to New Orleans. After serving in groups like the Continental Drifters and Lil' Queenie and the Percolators, they landed a gig at the famous club Tipitina's in the Crescent City, and for that performance, came up with the name the Subdudes. Their sound was steeped in the New Orleans tradition, borrowing influences from R&B, a little zydeco and the vaguely rhumba-flavored style of Professor Longhair. Their instrumentation was an interesting blend of the standard guitar and bass, but with an accordion -- certainly not uncommon in Louisiana music -- plus percussion provided mostly by a simple tambourine played by Steve Amadee, who became the group's most distinctive sonic signature. The other Subdudes include Tommy Malone on guitar and lead vocals, John Magnie on the keyboards, including the squeeze box, and bassist Johnny Ray Allen. Later in 1987, the Subdudes moved to Boulder, Colorado, but their musical hearts remained in New Orleans. After being signed to Atlantic they released their debut album in 1989. While the group hardly achieved massive hit status, they immediately won recognition and fans in the musical community for their distinctive and thoroughly honest sound. They became in-demand guest musicians on albums by Joni Mitchell, Shawn Colvin, Rosannne Cash, and fellow Coloradan Tim O'Brien, among others. While the group did a lot of touring, following their second album, they were dropped by their record company after they had already recorded a third, which was never released as intended. Then after a three-year hiatus, they returned on Windham Hill's High Street label with Annunciation, an outstanding album that captured all that the Subdudes did best. It was recorded in New Orleans, with some of the tracks produced, interestingly by the famous British rock producer Glyn Johns. These days, the four Subdudes all live in different parts of the country, but according to a record company press release, locked themselves in a cabin in Red Feather Lakes, Colorado, for a week and did some serious songwriting. And this time, they came up with a rather more stylistically diverse batch, which they proceeded to take to New Orleans to record. For their producer, they enlisted a veteran figure on the Crescent City music scene, Clark Vreeland. The result is another fine recording that expands the group's scope without sacrificing what has made them so distinctive musically, and appealingly honest and unpretentious. Primitive Streak does run from more electric and even rock mainstream in sound, to a song with a string trio providing the accompaniment. But most of the time, it's the instantly recognizable Subdudes sound with accordion, tambourine and some slide guitar. On this album, they are joined by several guests, including honorary fifth Subdude Willie Williams of the Zion harmonizers, who sings and plays guitar, a horn section, the above-mentioned string players, and Bonnie Raitt who adds her vocal and guitar to one especially memorable tune. Lyrically, the Subdudes often have a gospel-like quality to their writing. Though they may cover the well-travelled ground of personal relationships, they often do it in a manner that urges optimism in the face of difficulties. The also look at death on a couple of songs from the perspective of passage to the hereafter. The Subdudes, on their new fourth album Primitive Streak, have created another fine record that epitomizes the so-called American Roots Music sound. Drawing on influences from their native New Orleans, adding their distinctive blend of sounds like accordion and a tambourine for percussion, plus their very unpretentious style, upbeat and hopeful lyrics; they create music that is unmistakably their own: no easy feat in the crowded pop world. It's music that's rhythmically contagious and could appeal to fans from Baby Boomers to their kids for whom this kind of sound is something new and cool. Sonically, the album is rather well done. The mix ranges from outstanding to a bit gimmicky at times, but the sound quality is good, and there's not too much audio compression. Though the Subdudes last album Annunciation from just about two years ago, was probably their best recording overall, Primitive Streak, is on the same level, and in some ways more interesting and varied. (c) Copyright 1996 George D. Graham All rights reseved.